"Moscow: Kotel’nicheskaia Embankment Building [Russia]" by Chet Smolski, Dimitry Chechulin et al. The high rise building pictured is the Kotel’nicheskaia Embankment Building (alternate spelling Kotenicheskaya), a high rise apartment building in Moscow. It was built as part of the vysotki (tall building) project which added seven high rise buildings to Moscow’s skyline. The intention was for these high rise buildings (commonly referred to in English as the Seven Sisters) to act as an aesthetic buffer between the existing skyline and the proposed (never completed) Palace of the Soviets, which, at 400 m, aimed to be the tallest building in the world. The designer, Rostovskii, was awarded a Stalin Prize for architecture in 1949 to design the building along with Chechulin. 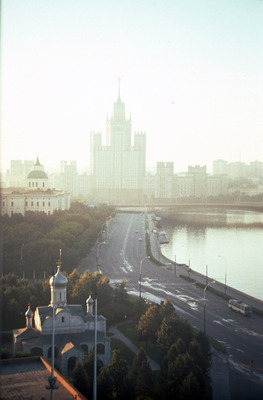 Smolski, Chet; Chechulin, Dimitry; and Rostovsky, Andrei, "Moscow: Kotel’nicheskaia Embankment Building [Russia]" (1976). Smolski Images. 870.